The ES-O “Berkeley” is named after the small Northwest Denver neighborhood in which it is crafted. 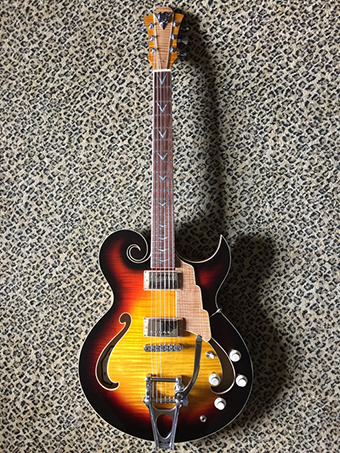 Its concept is to provide an exquisitely styled original guitar with very classic ES tonality, but with a broader, more balanced frequency range than available in a standard semi-hollow guitar. The core and neck laminate design is key to both the guitar’s brilliance and warmth, in addition to the sonic qualities of the big ’59 neck carve. The ES-O “Berkeley” is a fully handmade guitar for the ages, with unmatched tone and playability. All V16 guitars come with a lifetime workmanship guarantee. Shell Wood: 3-Ply Curly Maple top and back. Core Wood: 4”wide rift-cut soft maple sandwiched between serrated layers of Fir. Binding: Comes standard double-bound with choice of single layer ABS cream or grained “Ivoroid” celluloid plastic. Wood binding (add $800). ABS or grained “Ivoroid” celluloid plastic F-hole binding (add $150). Neck Wood: Choice of standard 5-ply quarter-sawn rock or soft maple, purple heart, and Honduras mahogany or traditional 1-piece quarter-sawn Honduras mahogany (add $250). Carve: Standard big ’59 C-carve, .87” at the first fret, and .92” at the 12th fret. Other carves available upon request. Frets: Standard jumbo, or customer can choose at will at no extra charge. No stainless steel. Binding: Grained “Ivoroid”, plain cream, or wood (add $50 for all). Nut Material: Bleached or unbleached cow bone. Inlays: Standard MOP (yellow or white) dots. Available hand-inlayed MOP/abalone “V’s” (add $500). Pickups: Two hand-wound, wax-potted V16 “777” humbuckers made with butyrate plastic bobbins, nick-silver baseplates, and maple spacers . Approximate output – 7.77k ohm, choice of Alnico A2-A5 magnet. Pickup Rings: Black or cream butyrate plastic, or hand-shaped figured maple (add $75). Controls: Two volume and two tone CTS 500K audio taper pots with optional resistor/capacitor networks (keeps frequency band when turning down volume, add $25), Switchcraft 3-way selector, Switchcraft output jack. Push-push or push-pull coil tap available (add $25 per). Hardware: Choice of Bigsby B7 or B12 vibrato, ABM solid milled brass roller bridge, Hipshot open backed locking tuners. Strap pegs of choice. Stop tail or trapeze set up of similar quality available at no extra charge (gold hardware at $100). Choice of hand-made figured maple pickguard (add $100) or plastic pickguard (add $75). Finishes: Poly finish standard and available in a range of colors at little to no extra cost, except natural (add $200).